Sometimes I wonder if I’m ever going to run out of new things to say about the economy. Nothing interesting has happened in a long time. Our liquidity-drunk “markets” remain over-priced due to the chronic intervention of the global central banking cartel, which has demonstrated over and over again that it won’t tolerate even the slightest drop in asset prices. Those familiar with my writing know I put the word “markets” in quotes because we no longer have a financial system where legitimate price discovery is a regular — or even recognizable — feature. It’s destined to fail. What more can be said about such a flawed system? And failure to pay attention at this stage of economic and ecological history will prove to be exceptionally painful. It’s been a long 7 years for those of us who believe fundamentals matter. For quite some time they have not. So we reality-based fundamentalists have largely been reduced to pointing at the parade of policy failures and ham-fisted market manipulations and saying, essentially, That’s just dumb. But ‘dumb’ mistakes have become ‘stupid’, and ‘stupid’ became ‘idiotic’, and now ‘idiotic’ mistakes are piling up, accumulating into a mountain of stored potential energy that will someday topple destructively across the global markets. We’ve all known, deep down, that money printing is not the same as capital formation, and that prosperity never truly results from redistributing wealth from one group to another. And yet, far too many have been willing to play along and place their trust in the central banks. Well, we’ve finally reached the beginning of the end. The global experiment with our current flawed economic and monetary models are drawing to a close. The fetish worship of central banks, bankers, and banking is over. Belief in central bank omnipotence is being chipped away at daily, as it’s becoming increasingly clear that the easing policies of the past seven years have only served to kick a can down the road — a can that can longer be kicked any further. Once the illusion of central bank control is fully lost, the financial markets will implode in a deflationary wave that has been held at bay for far too long. Asset prices will collapse, companies will fail, and millions of jobs will be lost. People will re-discover that partying too hard for too long earns a massive hangover. In short: There will be hell to pay. I’m still not able to predict whether we’re a week away from this or five years. Such is the uncertain fate of living within a nested set of complex systems run by fallible humans. Complexity complicates prediction. Though while we cannot predict exactly what will happen, to what degree it will manifest, or precisely when, wecan track the ‘fingers of instability’ in the system and note that these are growing longer, and steeper. For instance, total worldwide debt is more than $60 trillion larger than it was before the 2008 financial crisis. So we can make conclusions like “larger” and “sooner” about the probability of the coming correction. The final remaining bulwark that needs to give way before we a full-blown correction occurs is central bank credibility. The public perception of an “all-knowing, all-powerful” entity needs to be replaced by a more realistic view of what central banks actually have done, and realistically ever can do, which is a whole heck of a lot less than most currently ascribe to them. It helps to start by looking at the actual track record of the central banks over the past 20 years. What the central banks claimed they were after – rapid GDP growth, a set rate of inflation and rising incomes – has not materialized in the way they hoped. After more than tripling their collective balance sheets since 2008 (an increase of nearly $12 trillion) to stimulate the world economy, global GDP growth is still stumbling along at an uninspiring 2.5% — and showing signs of slowing. As I said: not an impressive track record. But lots of people still treat the Federal Reserve, and ECB, BoJ, BoE, etc., as if they’re doing something terribly sophisticated, important, and worthy of our admiration. But what have they really done besides flooding the world with cheap and abundant money? Well, for starters, they’ve created the largest wealth and income gaps on record, over-inflating financial assets and creating conditions ripe for aggressive financial engineering by corporations, both of which reward the top 1% preferentially. In this first chart we can see the effect of three serial bubbles blown by the Fed on household income broken out by income level. 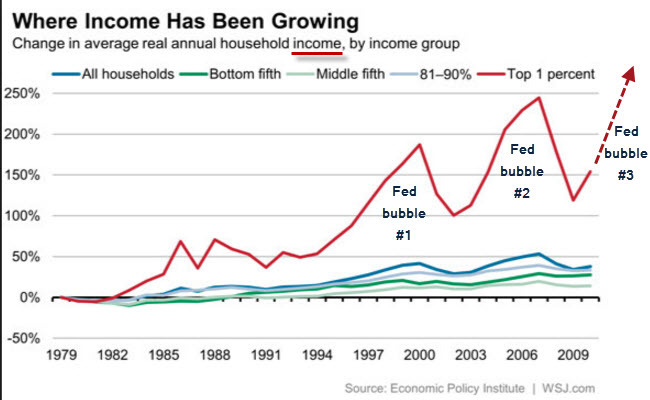 The top 1% has gotten all the gains in each of these bubbles. The only defense the Fed has is to claim that“Well, things would have been even worse for the lower 99% if we had done anything different”. But this rings as hollowly as any prove-a-negative defense. We cannot know how things would have been different for the bottom 99% if the Fed had done things differently. But we can know, with 100% certainty, that if the Fed had not dumped money into the financial system and hadnot targeted rising asset prices that the incomes of the top 1% would not have skyrocketed like this. It’s really simple: when you financialize an economy, those with the most direct access to the money in that system — which is by definition a tiny elite — are going to benefit the most. And it’s not the 1% we’re talking about here, but the 0.1%. The more financialized the system, the more highly concentrated the wealth becomes. Given this tremendous [wealth] disparity, I’m reminded that Plutarch once cautioned that an imbalance between rich and poor is the oldest and most fatal ailment of all republics. More immediately, this helps us understand why the great credit crisis of 2008 worse than expected. Just as was true of the wealth gap in the late 1920s before the onset of the great depression, the severity of a crisis does not depend on average wealth, but the distribution of the wealth. If a large swath of the population lacks the means to weather the storm, then the storm will be longer, and harsher than otherwise would be the case. So what does it mean that 80% of our population possesses a meager 11% of the total wealth? For one thing it means that the recent efforts by the Fed to provide massive amounts of liquidity support to the biggest and wealthiest banks at the inflationary expense of the lower classes were not only misguided, but they were cruel and unusual. 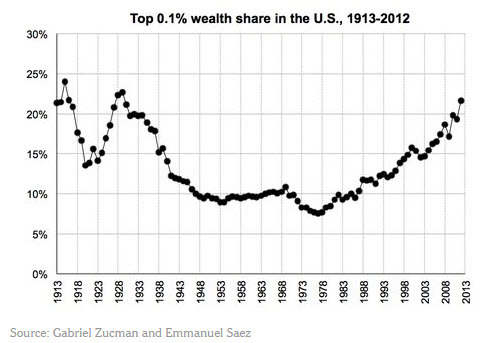 This leads to an easy prediction to make: The wealth gap in the US will hamper our recovery and deepen the downturn. 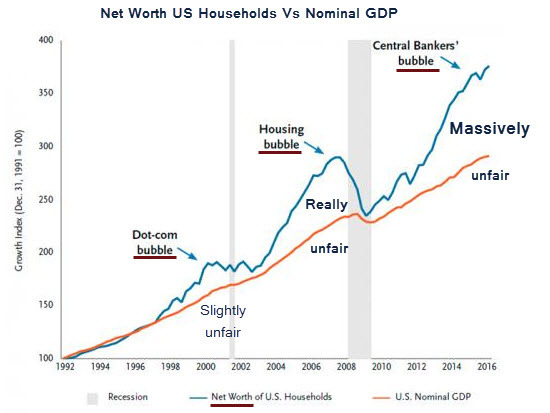 What is mysterious, are the repeated efforts by the central banks to act dumb and pretend as if their reflation efforts have not created the massive, glaring wealth disparities seen so clearly on every chart of income and wealth available to us. FRANKFURT—The European Central Bank’s massive bond-purchase program and other easy-money policies probably haven’t worsened inequality in the eurozone, Germany’s Bundesbank said on Monday, hitting back at concerns that central banks are taking on an increasingly political role by redistributing wealth. In a report, the Bundesbank argued that while recent ECB policies have helped bolster stock and property prices, they have also supported economic growth and employment, thereby helping poorer people. “It seems very doubtful that [the ECB’s] special policy measures of recent years have increased inequality in an overall context,” the Bundesbank wrote. I’ve never wanted to punch a sentence before, but I do now. I can’t believe how tone-deaf and utterly disconnected from a very obvious and inarguable reality that last statement by the Bundesbank is. I think I was pushed over the edge by the pedantic and meaningless phrase “in an overall context.” I’ll get over it. But again, we’re supposed to believe that the massive wealth gains of the upper classes are somehow an equal exchange for poor people not losing their jobs? The contest is not even close. You read that right: just Wall Street’s bonuses alone in 2013 were 2x greater than the entire take home pay (pre-tax of course) of every single person in the US working for minimum wage. So it’s really rather grotesque and unacceptable for the Bundesbank and Yellen et al to attempt to claim that central bank policies have been equally beneficial to all segments of society when taken in an overall context. No, they most certainly have not. They have been massively and disproportionately unfair and the recent populist uprisings across the globe are proving as much. Central banks, of course, have access to the same wealth charts as everybody else. There’s no room for debate on the matter. Financial asset price inflation has preferentially benefitted the very tippy-top of the wealth pyramid and has done so at the expense of the bottom tiers. Why it has taken this long for the anger to begin appearing on the political and social landscape is beyond me. But it is finally here, and the central banks are feeling the heat. Monday’s report marks the Bundesbank’s latest effort to defend the ECB and its independence amid concerns voiced by politicians that years of ultralow interest rates are hurting savers and pensioners. The damage wrought by ZIRP/NIRP extends beyond savers and pensioners to all segments of society in the bottom 99%. This large cohort is increasingly angry, disconnected, and unwilling to simply play along any more. The fact that the central banks are now “defending” their policy framework from any criticism that their policies have been unfair tells us that we are now at Act Two of this drama. Act One involved ignoring the problem and pretending it didn’t exist. Act Two is to defend the status quo. We’ll know we’re at Act Three when they start acknowledging that the problems are real, and that change is needed. The current system will do all in its power to delay the arrive of Act Three because it will come with a proper and thorough shredding of central bank credibility, along with a painful downward correction in sky-high asset prices. Which is why we have a “Fed cred” problem. Our central banking high priests and priestesses have been doing their rain dance for an uncomfortably long time, and awkwardly, there’s still no rain. Regular people and the cheerleaders in the mainstream media are beginning to take notice. Look for this unease to grow; it won’t be long before you attend a cocktail party and someone pulls you aside to complain about the Federal Reserve’s policies. All this matters because once faith in central banks is lost, their power to delay the deflationary day of reckoning goes with it. The stupendous amount of debt they have helped heap onto the financial system since 2008 will start going into default and the only question that will matter is: Who is going to eat the losses? The daisy chain of bubbles in stocks, real estate and the mother of them all — the bond market — will pop, adding additional losses to the growing bloodbath. In Part 2: Prepare For The Global Deflationary Deluge we track where the carnage is most likely to occur and which risks are most important to protect yourself against. A deflationary downdraft is an extremely scary time in the world, nothing appears safe. It’s very important to have come up with a plan to safeguard your capital and taken prudent action beforehand. Otherwise there will be hell to pay. posting on your site ? I can provide high quality posts for you.